As old as America itself, Clinton was originally founded near the Potomac River as Surrattsville even before there was a Washington, D.C. Following the notoriety of the Surrattsville name for the role it played in the Lincoln assassination, the town’s name was changed to Robeysville shortly after the end of the Civil War. After another name change to Clinton in the late 19th century, the town began its rapid development as one of Washington, D.C.’s many suburban communities, housing the area’s many Federal civil servants, including workers at Andrews Air Force Base, home of Air Force One. Like the rest of Prince George’s County, Clinton experiences hot, humid summers and unpredictable hurricanes, blizzards, and thunderstorms throughout the year that can cause flooding along the Potomac and its tributaries that snake throughout the county. With all that moisture comes the risk of mold and mildew growth in area basements. If you’ve noticed a strange smell in your house, you may want to contact a company that specializes in mold remediation Clinton to make sure mold isn’t causing irreparable damage to your home. How Does The Water Get Into Your Home? Especially in Clinton, there are three ways that water can find its way into your home. The most common way water finds its way into your home is through condensation. In Clinton, you can not only see the humidity in the air when it condenses onto a cold glass of iced tea during the summer, you can feel it, making the summer air thick as molasses. That same humid air, when it hits your cool basement walls, causes condensation that leaves excess moisture in your basement—excess moisture that encourages mold and mildew to grow. Another common source of excess moisture, especially in the older Clinton homes that sprung up in the 1950’s, is leaky pipes. Homes are complex structures with many interconnected systems. Subjected to decades of wear and tear, these systems, including pipes, begin to break down. A pipe leak, even a small one, can leak enough water into your basement to encourage mold growth, often without you even noticing before it’s too late. Less likely, but still a real concern for older homes in Clinton, is foundation damage that can let water into your basement. Concrete is not indestructible, and over several decades, it can crack and develop gaps. These imperfections in the concrete are passageways for underground water to find its way into your basement. Mold is a common part of household dust, and small amounts of it are present just about everywhere naturally. They only become problematic when they accumulate in large quantities. Because dark, moist basements are ideal breeding grounds for molds, they are often where molds tend to accumulate. In some cases, molds can produce mycotoxins, which can cause a wide variety of problems including neurological damage, interruption of protein synthesis, compromised immune systems, and upper respiratory obstructions. Mold can also result in significant property damage. If you catch mold growth early on, you can sometimes clean the infected items or surfaces. But if you let it grow too long, infected areas may become irreparable and must be replaced completely. Because mold feeds on wood, and other organic matter, an undetected infection can cause serious damage to your home’s structure. 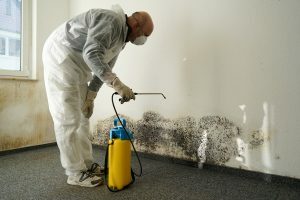 If you suspect you have a problem with mold, you should opt for professional mold remediation in Clinton. A lot of the time, you can smell mold before you can see it. Professionals who specialize in mold remediation in Clinton can assess the situation and determine the best way to clean up mold that may not even be visible to the untrained eye. Furthermore, only with professional mold remediation in Clinton can you be sure that you are preventing reoccurrence of the problem. Even dead mold can continue to cause harm to human health, and professionals not only clean up the mold, but fix the source of excess moisture to ensure that mold does not regrow in your home.